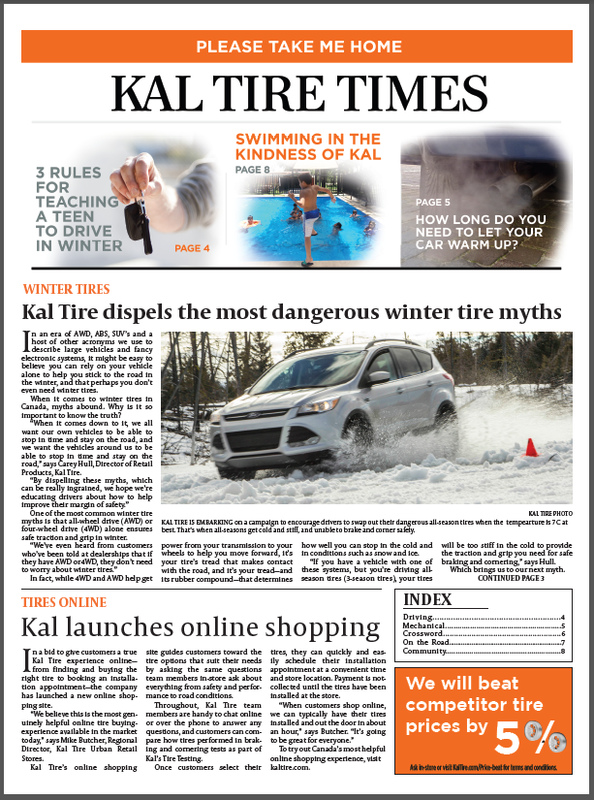 Kal Tire Times is Hot off the Press! Little boys splashing in a schoolyard pool in Hermosillo, Mexico. The truth behind how long you really have to let your car warm up. Possibly the world’s best winter tire ever. These are the subject of just a handful of stories in the fall 2017 edition of Kal Tire Times, our very own newspaper. As always, we’re excited to bring you a range of stories to help you learn more about tires, vehicles, driving, our outstanding team members and the ways we support the communities we serve around the world. This winter, we’re doing everything we can to dispel the most common and dangerous myths about winter tires so we can help make roads safer for everyone. In this article, we break down the four most common reasons why drivers think they don’t need winter tires, and what they’re risking by believing in the myth. If you really want your teen to be a competent, confident winter driver, an Alberta Motor Association Driver’s Education instructor recommends helping them get behind the wheel in December, and starting with three critical rules. A sweet and inspiring story about how two renovation projects funded by our Mining Tire Group’s Kal Tire Mexico are bringing smiles, laughter and a healthy future to a group of schoolboys. What would a newspaper be without some of these great pieces? Bill’s Tip. We’ve got expert advice from popular and licensed TV mechanic Bill Gardiner about what kind of tires are best for Canada’s snowbirds. Comic. Yes, we’ve got a comic. And the main character is a rather large dog. Crossword. With words gleaned from articles throughout the paper, this issue’s crossword promises just the right amount of tire-rickery! The Kal Tire Times begins arriving in the lounges of our Kal Tire stores this September, so look out for a copy while you’re in the lounge and please feel welcome to bring it home! If there’s a topic you’d like to learn more about, chances are we’ve got a host of helpful articles in our online Resource Centre!